Today, I headed out to Jamaica Bay to finish off the task of planting the remaining Virginia Roses (Rosa virginiana). My helper, Nancy, from the first part of the planting project, had put an additional plant into the ground over at the Bird Blind and that left me with about thirteen plants. Five of which I planted behind the bird blind. The plan today, was to plant the remaining eight plants near the visitor’s center by the walkway to the rear of the building. I got to the center around 9:45 a.m. and started planting by 10:00 a.m. later on, I was joined by Nancy who helped me to water the plants once they were in the ground. Hopefully in May - July next year, I will have photos of blooming Virginia Roses to share. As Nancy and I were heading back into the visitors center to put away the tools, we came across a birder who I noticed was trying to focus on some bird subject in the shrubs just to the left of the visitor center door. I stopped and began looking in the shrubs to find the subject, I did not have to look for too long as I saw a flash of yellow. Selecting a good spot as my marker, I swung up my Bi’s, which were around my neck and focused on the spot. Our subject turned out to be a Blue-headed Vireo. 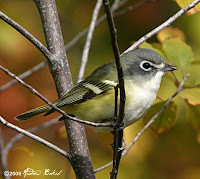 I hung around with the birder who introduced himself as Bob, and we had several good looks of the Vireo. We also saw a couple of White-throated Sparrows and Song Sparrows. In addition, during the time I was working, I had also heard and then noticed several Downy Woodpeckers, Yellow-rumped Warblers and also heard and saw a small flock of Pine Siskins flying overhead. 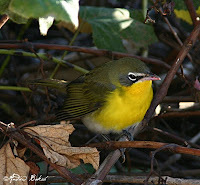 Here are some photos of the Vireo. Blue-headed Vireo also known as the Solitary Vireo. 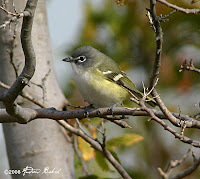 A closer look at the Blue-headed or Solitary Vireo. 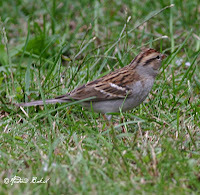 As Warbler migrations comes to a close, I have seen the variety of sparrows increasing, with a number of White-throated now visiting. 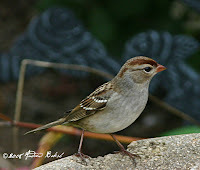 In addition, I saw and photographed a juvenile Chipping and White-crowned Sparrow. Today, I had planned on heading back out to Stracker Pond at Forest Park, in the hope of getting another look at that mystery warbler (see my October 11th post on the Warbler Watch Walk). Instead, I ended up in Central Park chasing down a Connecticut Warbler that was reported among the Pinetum area. I left Queens a bit late and mused whether it was going to be a wasted trip since the bird had already been seen for a few days and the chances of it still being around was less with each passing day. Nevertheless, I erased all negative thoughts from my head and focused instead on reading up on the habits of this bird, so I would be prepared for my search. Once I got to the Pinetum in Central Park, I ran into a few other other birders; coincidentally, some of them had attended the Robert Moses Walk the day before and they all expressed their satisfaction about the trip. The birders, spread out around the Pinetum and I tried out some phishing, which only brought in Yellow-rumped and Palm Warblers. Then suddenly a bird flew into the pine tree near the benches closest to the walkway. I got excited because it looked like it was the prize, but tempered my enthusiasm because the look was not clear. I took my eyes off the bird for a brief moment to call over one of the other birders for a second opinion and the bird took off to the left of me and I lost it. Sighing, I looked over to the left and where I thought it had landed when another birder who was right in the vicinity turned around and said, I think I got it. I quickly moved to the pathway towards the birder and he then said he had lost it after he had turned to call me. I continued scanning the ground and lo and behold first the head, then the elusive Connecticut Warbler came into view. I made sure the other birder next to me had the bird in his binoculars and then turned around and waved the other birders over. What great looks we had! In observing the Connecticut Warbler, one got a sense on why it is so hard to see; the bird moved fast and kept low to the ground. This was a lifer for me as it was for many of the birders present. My only regret was not having my camera with me. This morning, I did a bit of birding or more like just checking the action outside and saw, a White Breasted Nuthatch, The Yellow Breasted Chats (that I had seen and photographed the other day), White Throated Sparrows, and a tanager. The jury is still out on the ID of the Tanager on whether it is a Scarlet or Summer. Logic would point to a Scarlet since this is the expected local species; however, there is ample color to play with here that one can speculate a "morphing" Female Summer Tanager...one can hope can't they. 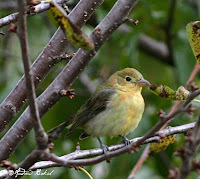 Scarlet or Summer Tanager...not that easy to call. 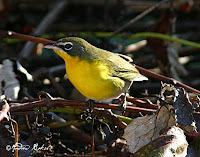 Not one but two Yellow Breasted Chats were spotted this morning around the Grape Vines and Winterberry shrubs (Ilex verticillata). I got a good look at the one in the grape vines and was able to get a couple of decent photos. Lovely olive back and yellow chest, with strong spectacles...makes this no doubt as to the identity of this bird.